The world need look no further than the catastrophe in the Philippines to comprehend the profound and dangerous consequences of a warming planet, United Nations Secretary-General Ban Ki-moon warned today, urging negotiators at a United Nations conference in Warsaw to rise to the challenge “with wisdom and urgency” and pave the way to a binding climate deal by 2015. Extending his deepest condolences to those affected throughout the Philippines by Typhoon Haiyan, he said that all around the world, people now face and fear the wrath of a warming planet. Offering another sobering example, Mr. Ban said that earlier this month he visited the Sahel, together with the President of the World Bank, and had witnessed climatic conditions – including extreme drought – undermining the region’s development and security. “All of us in this room share a momentous responsibility. We must rise to these challenges with wisdom, urgency and resolve to address climate change,” he said, expressing deep concern that the scale of efforts being undertaken by the international community are still insufficient to limit global temperature rise to below 2 degrees Celsius from pre-industrial levels. “All of us in this room share a momentous responsibility. We must rise to these challenges with wisdom, urgency and resolve to address climate change,” UN Secretary-General Ban Ki-moon said. But the UN chief said that he is also hopeful because there has been progress on multiple fronts towards a low-carbon future. Governments, business, community groups, women, youth and indigenous leaders are building collective capacity. New programmes for sustainable cities and climate-smart agriculture are delivering benefits of people and the planet, and global demand for renewable energy continues to rise very sharply. “We now know it is possible to close the emissions gap. We must build on this momentum,” he said, stressing that the United Nations, for its part, is engaging on many fronts including “Greening the Blue” by reducing the Organization’s footprint and working towards climate neutrality. Noting that delegations in Warsaw have agreed to finalize an ambitious global legal agreement on climate change by 2015, Mr. Ban acknowledged that there is “a steep climb ahead” and called for action in four areas: swift ratification by all countries of the second commitment period of the Kyoto Protocol; stepping up on finance, including long-term finance and the Green Climate Fund; agreeing a comprehensive action agenda to meet the climate challenge; and laying firm foundations for the 2015 agreement. “Success in Paris means bringing substantive progress to Lima. That means [in] Warsaw here we have to build a crucial stepping stone,” he said, looking ahead to the next meetings of States parties to the UN Framework Convention on Climate Change (UNFCC). 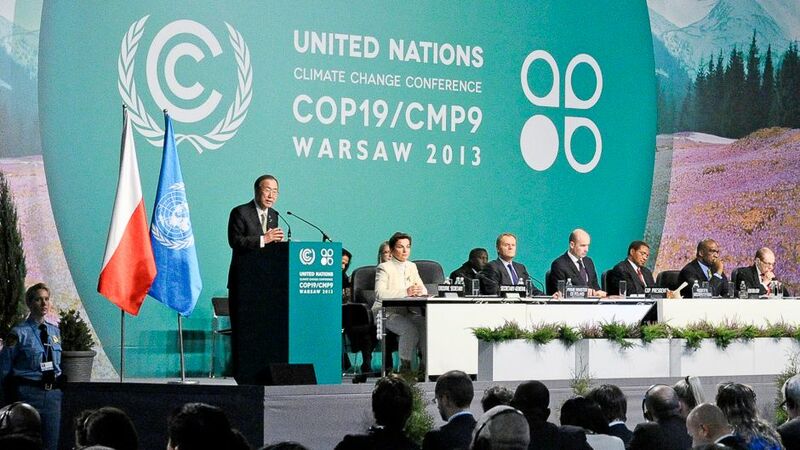 The Secretary-General drew attention to the climate summit he intends to convene on Tuesday, 23 September 2014, ahead of the opening, next year, of the annual General Assembly debate. That meeting is meant to complement the UNFCCC process and to be a “solutions summit,” not a negotiating session. “This will be a complimentary session to the ongoing UNFCCC negotiation process,” he said. He noted that recent catastrophic events have made it all the more obvious that action is needed. They require, he said, resolute measures and a vision well beyond the usual political posturing along with a political willingness to look beyond particular narrow interests and focus instead on the common good for all.